Who loves bacon? We all love bacon and this bacon green bean casserole will surely take care of that craving! A comfort food you love, with a little extra yum! 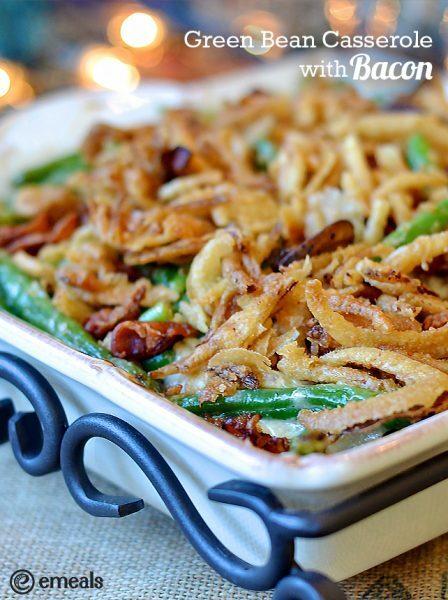 This green bean casserole with bacon is easy to make and tastes delicious. Whether you’re preparing for the holidays, or just looking for a delicious dish to serve your family, this recipe is perfect! Are you attending a pot luck dinner party? Now you know what to bring! You’ll certainly get rave reviews for this bacon green bean casserole! Learn more about emails and get more recipes like this when you sign up for your free two week trial! Doesn’t it look SO good? Preheat oven to 350°F. Cook beans in microwave as directed. Transfer to a large bowl. Sauté mushrooms in butter in a large skillet over medium-high heat 10 to 12 minutes, stirring once after 8 minutes. Season with salt and pepper. Add to beans in bowl. Cook bacon in skillet until crisp. Crumble bacon, and add to beans. Reserve 1 Tbsp drippings in skillet. Cook onion and garlic in drippings until tender. Add to beans. Stir in Alfredo sauce and cheese. Spoon into a greased baking dish. Sprinkle with French fried onions. Bake 20 minutes or until bubbly.